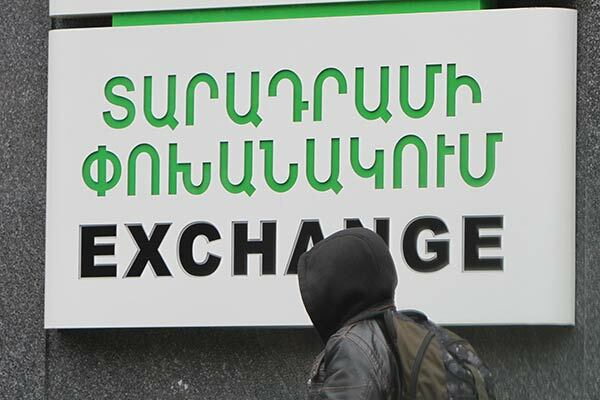 Most commercial banks and exchange offices in Yerevan did not sell hard currency to citizens on Tuesday evening after a day of what could be described as ‘panic foreign exchange buying’. Some businesses, meanwhile, responded to the turbulence on the financial markets by stopping their trading in anticipation of stability. Some stores and supermarkets in Armenia set limits on purchases of certain basic foodstuffs, others were changing price tags several times during the day revising the prices upwards. According to the CB rates released for Tuesday, the dram fell by an average of 18.56 points to stand at 490.34AMD/1USD, while the fall of the Armenian currency against the Euro and the British pound made 28.25 and 29.77 points, respectively (614.20/1 EUR and 770.32/1 GBP). The selling price of the US dollar at some exchange offices in Yerevan on late Tuesday reached 575 AMD, but currency traders said they did not have any dollars to sell. Meanwhile, some banks purchased dollars from the population for up to 535 AMD/$1. During the day commercial banks sold limited amounts of hard currency only to their customers. Queues were observed at bank offices during the day, with some people angered by the situation when they literally saw the dram exchange rate falling on the display as they stood in the queue waiting for their turn to buy some foreign currency. The current depreciation of the dram started in late November. Before that, for a durable period of time the Armenian national currency traded at around 410-415 AMD against the dollar. On December 8, the CB declared a “new approach” to stabilizing the national currency as it began selling fixed amounts of dollars to Armenian commercial banks on a daily basis. The financial regulator said the move was aimed at dealing with “speculative” currency trading and would result in the stabilization of the currency market by the end of the year. For four days the CB sold $6 million on a daily basis, but on Monday and Tuesday it reduced the amount of its daily sales to $4 million. Armenian authorities as well as economists explain the depreciation of the national currency by developments in international markets, including the appreciation of the U.S. dollar against other currencies, the economic and financial situation in Russia caused by Western sanctions and falling oil prices. Another major factor cited by economists these days is panic among businesses and the population anticipating a serious shortage of hard currency in the near future. Neither the CB nor the government made any statements directly concerning the situation on the currency market as of early Wednesday.